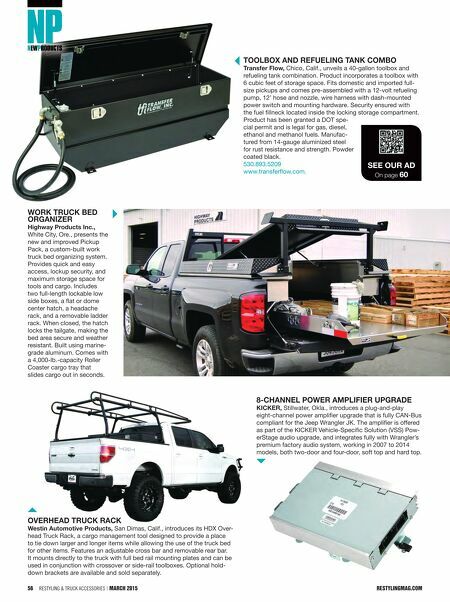 56 Restyling & tRuck AccessoRies | March 2015 restylingmag.com Toolbox and Refueling Tank Combo Transfer flow, Chico, Calif., unveils a 40-gallon toolbox and refueling tank combination. Product incorporates a toolbox with 6 cubic feet of storage space. Fits domestic and imported full- size pickups and comes pre-assembled with a 12-volt refueling pump, 12' hose and nozzle, wire harness with dash-mounted power switch and mounting hardware. Security ensured with the fuel fillneck located inside the locking storage compartment. Product has been granted a DOT spe- cial permit and is legal for gas, diesel, ethanol and methanol fuels. Manufac- tured from 14-gauge aluminized steel for rust resistance and strength. Powder coated black. 530.893.5209 www.transferflow.com. 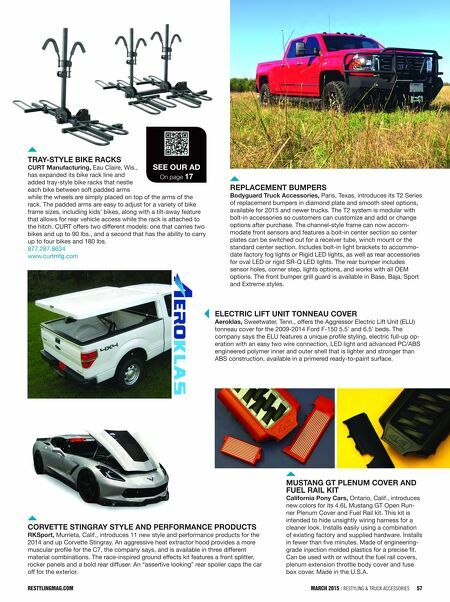 See ouR ad On page 60 WoRk TRuCk bed oRganizeR Highway Products inc., White City, Ore., presents the new and improved Pickup Pack, a custom-built work truck bed organizing system. Provides quick and easy access, lockup security, and maximum storage space for tools and cargo. Includes two full-length lockable low side boxes, a flat or dome center hatch, a headache rack, and a removable ladder rack. When closed, the hatch locks the tailgate, making the bed area secure and weather resistant. Built using marine- grade aluminum. Comes with a 4,000-lb.-capacity Roller Coaster cargo tray that slides cargo out in seconds. oVeRHead TRuCk RaCk Westin automotive Products, San Dimas, Calif., introduces its HDX Over- head Truck Rack, a cargo management tool designed to provide a place to tie down larger and longer items while allowing the use of the truck bed for other items. Features an adjustable cross bar and removable rear bar. It mounts directly to the truck with full bed rail mounting plates and can be used in conjunction with crossover or side-rail toolboxes. Optional hold- down brackets are available and sold separately. 8-CHannel PoWeR amPlifieR uPgRade kiCkeR, Stillwater, Okla., introduces a plug-and-play eight-channel power amplifier upgrade that is fully CAN-Bus compliant for the Jeep Wrangler JK. The amplifier is offered as part of the KICKER Vehicle-Specific Solution (VSS) Pow- erStage audio upgrade, and integrates fully with Wrangler's premium factory audio system, working in 2007 to 2014 models, both two-door and four-door, soft top and hard top.